Eagle Rock Entertainment has announced the September 25 release of the Gary Moore CD, DVD and Blu-ray title "Blues For Jimi". 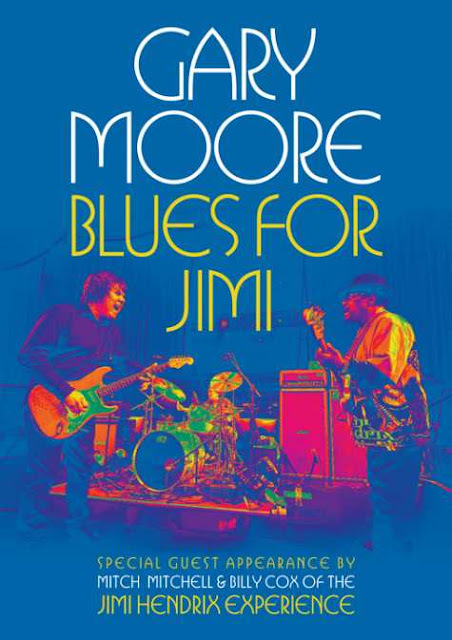 This release captures a unique concert featuring Moore playing Jimi Hendrix tracks, including such classics as "Purple Haze", "Foxy Lady","The Wind Cries Mary", "Hey Joe", "Voodoo Child (Slight Return)" and many more. Filmed at the London Hippodrome on October 25, 2007, it was part of the launch for the Jimi Hendrix "Live At Monterey" program. At the end of the night, Gary was joined by Mitch Mitchell and Billy Cox of The Jimi Hendrix Experience for three tracks. The full lineup for this show was Gary Moore (guitar, vocals); Dave Bronze (bass); Darrin Mooney (drums) with Billy Cox (bass on tracks 9-11, and also vocals on the first two of those) and Mitch Mitchell (drums on tracks 9-11). Both Gary Moore and Mitch Mitchell have passed since this concert took place, which makes the recording of this incredible night so special. Gary Moore was one of the finest British guitarists of all time and is one of the few players who could pay homage to Jimi Hendrix's groundbreaking and truly distinctive guitar style. This is a stunning tribute from one master guitarist to another.